Nature made her do it, the passion to respond to what she feels. shadow of a spectacular sunset. Painting is a musical experience for her, with each scene unfolding in a symphony of color. Painting gives Jeanette’s life meaning and purpose and a great deal of joy. Other than painting, traveling around Montana and the greater Northwest in pursuit of scenes to paint is the other best part of her artistic life. She relishes the opportunity to spend time in an area absorbing its song, listening and watching. For several years, Jeanette has been painting the Swan Valley, the Mission Valley and Glacier National Park. Her “special places” include Swan Lake, the Upper Swan River, the Bob Marshall wilderness and Holland Lake. Pastels are a luscious experience for Jeanette…opening a new box of colors makes her mouth water and her heart sing. 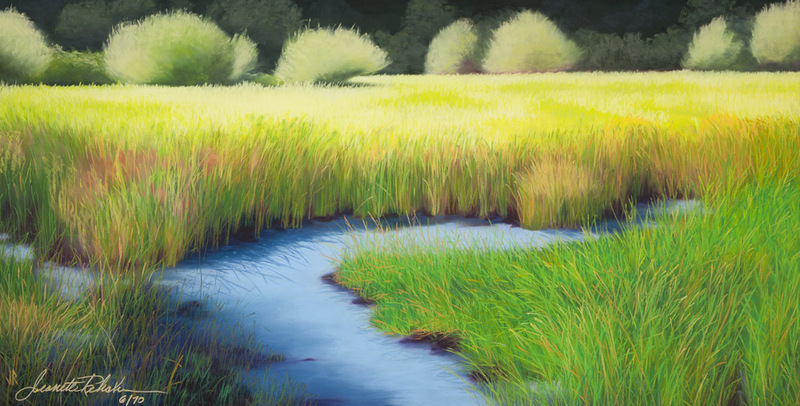 Unlike paints, pastels have a huge range of colors – all at her command – and she is able to work the soft pastels into each other, overlaying and blending color into color. Jeanette is often told that pausing with one of her paintings is a calming and peaceful experience that has a healing effect. Other fans imagine rolling in the grasses and feeling the same sensual explosion Jeanette feels as she paints. In this way, she connects with her audience through a common celebration of the joy of Nature.